Theosophy | Be Kind. We're all in this together. The word theosophy is derived from the Greek theos and sofia, meaning divine wisdom. 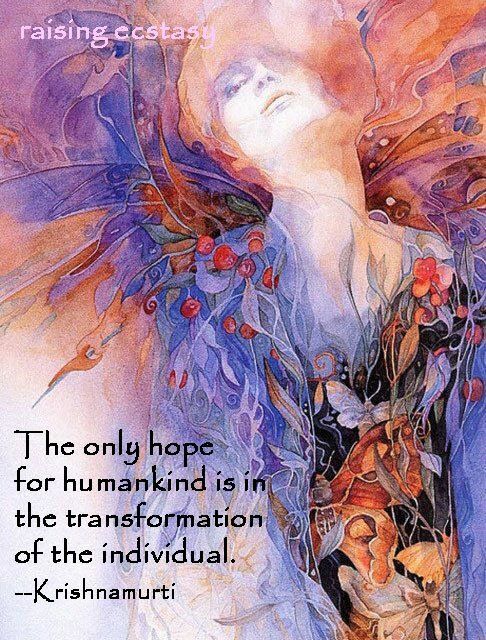 It is not a religion but an esoteric philosophy on spiritual evolution. This divine wisdom is as old as Creation. As such it is the spiritual heritage of all humanity and may be considered the essence of the great religions and philosophies of the world. Theosophical work implies study, meditation and service. Studying the theosophical concepts without practice in daily life, however, is a map that is not followed, whereas practice without clear concepts is a journey with no direction. Theory and practice are interrelated. Is theosophy something of the past? The TS was founded over 135 years ago. Many of its ideas have been incorporated in our current culture, while some of the comments in the original literature are due to the development of science. 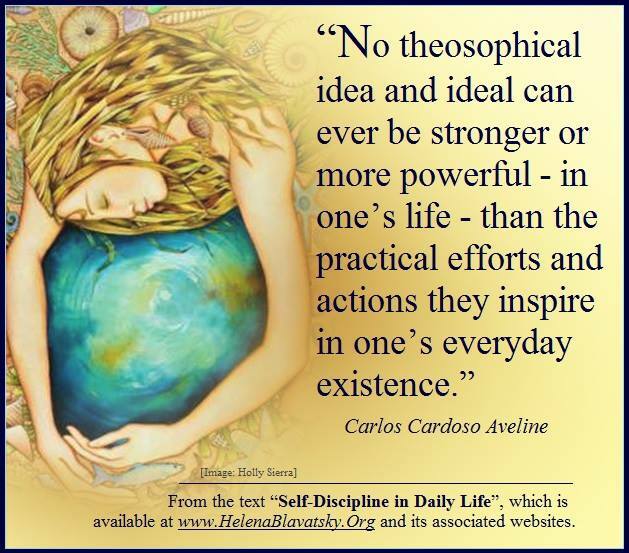 Theosophy is, however, maybe even more important ever. The motto of the Theosophical Society is There is no religion higher than truth. In many religions inner search for “Divine Wisdom” has been stale, at the expense of external forms. Members of the Theosophical Society believe that each religion is derived from the same source, and to a certain extend reflects the light of that One, Eternal Divine Wisdom. Those who follow a certain religion find its hidden – esoteric – wisdom through theosophy. Those without a religion will be able to enrich their image of man and universe with a profound philosophy, related to religious awareness, offering the opportunity of inner development and perfection. Theosophical literature offers a very broad range of books and articles on the different aspects of spiritual life, both from the East as well as the West. 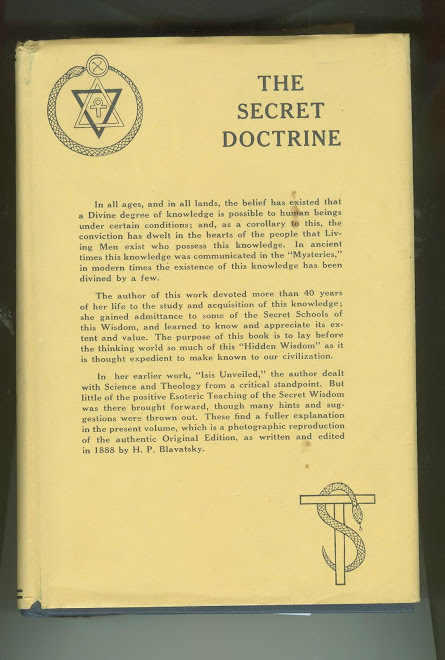 The most well known book is The Secret Doctrine, written by H.P. Blavatsky in 1888, based on the Stanzas of Dzyan, an ancient book on the creation of cosmos and man. The book is not a revelation but a collection of fragments from the scriptures of the world to explain these Stanzas. Blavatsky’s masterwork on theosophy, covering cosmic, planetary, and human evolution, as well as science, religion, and mythology. Based on the Stanzas of Dzyan, with corroborating testimony from hundreds of sources. This Unabridged Verbatim Edition is a character-for-character, line-for-line reproduction of the two-volume 1888 first edition. It is set in new type which closely matches the Miller & Richard Old Style font used in the original. The Index at the end of Volume II is the version revised in 1925. 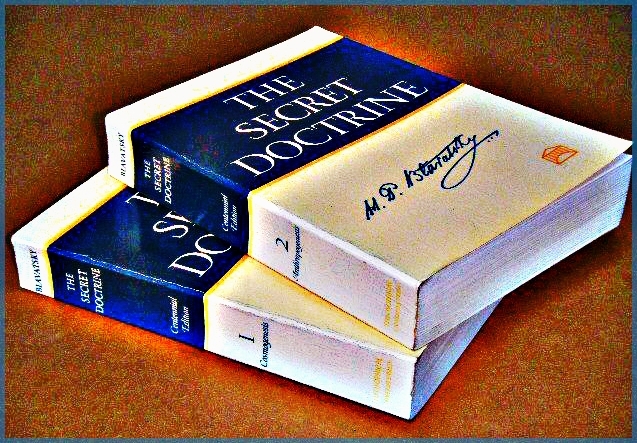 Readers are also referred to The Secret Doctrine: Index, a separate 440-page volume available in print and online. Theosophical University Press PDF eBook edition ISBN 1-55700-229-7 for the two-volume set. These may be downloaded free of charge for personal use. Absolute Reality is the source of all conscious life and matter in the universe. This implies absolute unity that underlies the phenomenal world and includes each individual person. Brotherhood is the practical consequence of the oneness of reality, including humanity. Forming a nucleus of universal brotherhood of humanity is the first object of the Theosophical Society, and the only object that each member needs to subscribe. God is a much more complex and profound concept than generally expressed by most religions. The word God is therefore largely avoided in Theosophical research, as it often leads to confusion and misunderstandings. The universe and all that is created is subject to constant cycles. 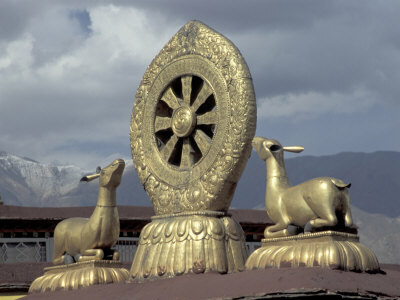 The different forms are subject to harmonious universal laws and a constant process of evolution. This evolution implies concepts such as “karma” and “reincarnation.” Studying these laws allows us to live in harmony with them. The fundamental unity of all souls, as such an aspect of absolute reality. Man is composed of different vehicles, including body, mind, soul and spirit. In that spirit we are fundamentally One. Human being is a microcosmos, corresponding to the microcosmos. Meditation is perfect silence or stillness of the mind, in order to experience Oneness, or the Divine. Sir Arthur Conan Doyle, British author of Sherlock Holmes stories, Spiritualist (1859 –1930). His theosophical interests are debatable. He looked into theosophy and was in touch with the Blavatsky Association about the Hodgson Report. Alfred Russel Wallace , naturalist who developed a theory of natural selection independent of Darwin, excepted higher mental capacities from the theory, a Spiritualist (1823 –1913). His theosophical interests are debatable. “I have tried several Reincarnation and Theosophical books, but cannot read them or take any interest in them. They are so purely imaginative and do not seem to me rational. Many people are captivated by it. I think most people who like a grand, strange, complex theory of man and nature, given with authority- people who if religious would be Roman Catholics.” quoted from William Brock, William Crookes (1832–1919) and the Commercialization of Science, 2008 (originally in Marchant’s 1916 biography of Wallace – it comes from an 1897 letter by Wallace). Carl Gustav Jung , founder of analytical psychology (1875 –1961). Was not interested in Blavatsky, Leadbeater or Besant, but was in frequent contact with G.R.S. Mead – after the latter had left the T.S. in 1909. Ian Stevenson , Professor of Psychiatry, University of Virginia and leading investigator of reported cases of reincarnation. Probably influenced by his theosophical upbringing. Rukmini Devi Arundale: Revitalized Indian arts, especially dance and music. 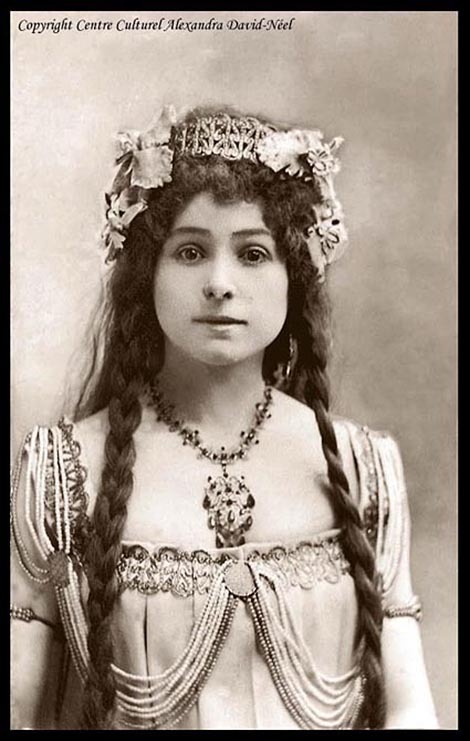 In her case membership of the Theosophical Society meant international contacts which made it possible for her to learn western dance and music, which in turn gave her the training necessary to breath new life into Indian dance. The way she ended up doing what she did is unthinkable without the contacts the Theosophical Society gave her. 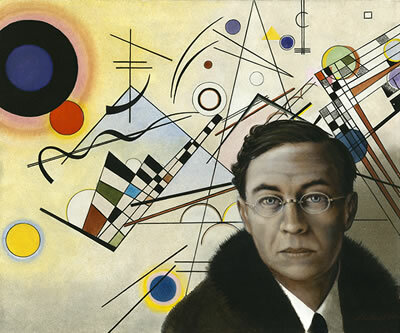 Vassily Kandinsky , Russian founder of nonobjectivist art (1866 –1944) Influenced by theosophy, not a member. Alex Grey. It seems unlikely this painter was influenced by the Theosophical Society, but he certainly sympathises with it as his link page testifies. Mohandas K. Gandhi , Indian patriot, framer of satyagraha (1869 –1948) Gandhi certainly knew Annie Besant, had great respect for her, and the version of the Bhagavad Gita that first acquainted him with Indian philosophy was her translation. In his autobiography he describes his early acquaintance in London with Theosophy and the Theosophical Society. The two “brothers” he mentions there are almost certainly the Keightley uncle and nephew, whom others have mistaken for brothers as they were so close in age. His contribution: a reformulation of Hinduism into a passive activism. Contributed significantly to the independence movement in India and the breakdown of the castesystem. 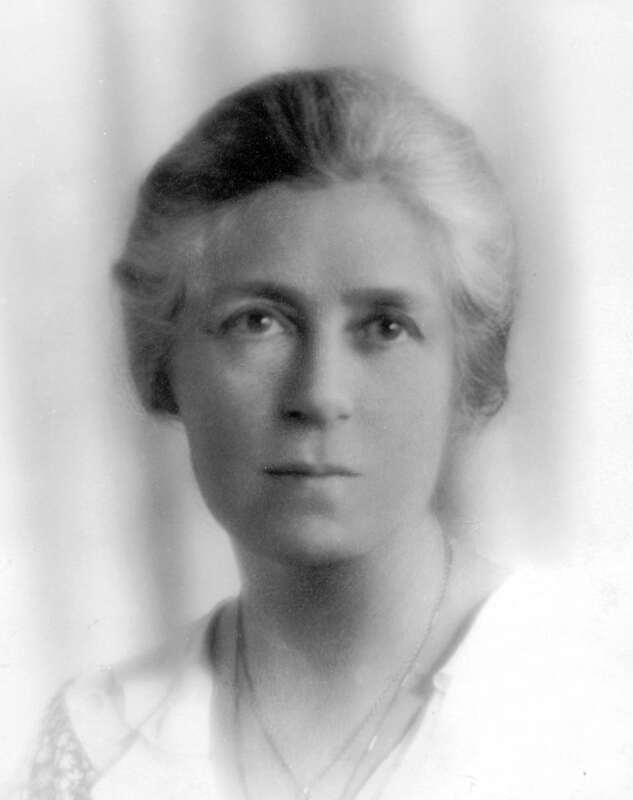 Clara Codd , A feminist who was imprisoned in England. Venerable Balangoda Ananda Maitreya (August 24, 1896 – July 18, 1998), ‘one of the leading figures of contemporary Buddhism, not just in Sri Lanka but throughout the world’ (see: Chapter 9 in ‘Buddhism Transformed: Religious Change in Sri Lanka’, by Richard Gombrich and Gananath Obeyesekere). G.R.S. Mead : introduced Gnosticism to popular knowledge in England and probably the world. Christmas Humphreys , English introducer of Buddhism to Westerners (1901 –1983). On Christmas Humphreys work as a judge. Christmas Humphreys: an article for the Canadian Theosophist. Dr Walter Gorn Old (born 20 March 1864, at 2:06 a.m. LMT in Handsworth, England; died 23 December 1929 in Hove, England) was a notable 19th century mystic and astrologer, better known as Sepharial. An eminent English Theosophist, Sepharial was a well-known and respected astrologer in the late 19th and early 20th centuries and wrote numerous books, some of which (particularly those on numerology) are still highly regarded today. He was editor of “Old Moore’s Almanac”, which is still published in the 21st century. In 1887 at the age of just 23 was admitted to the “inner sanctum” of the Theosophical Society. He was in fact one of the founder members of the Theosophical movement in England. 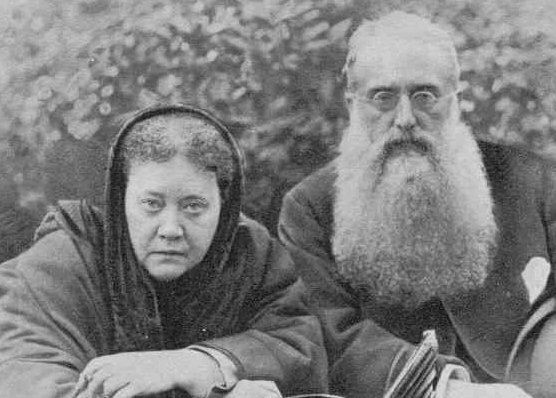 Madame Blavatsky (whom he lived with until her death) called him “The Astral Tramp” because of his nightly explorations into the astral plane (Ref: Kim Farnell’s book). Alonzo Decker (?? –1956), co founder of Black & Decker manufacturing company, joined T.S. in America April 3, 1929, member until his death. Franz Kafka, Aldous Huxley, Owen Barfield, Wallace Stevens, R. Tagore (he was at Adyar). Ken Wilber Publishes his first books through the TSA, but the first editions aren’t published by Quest Publishing, so it’s not clear whether this can be seen as a link between theosophy and his work. There are obvious similarities between his approach and the theosophical one, but there is no indication that he was ever a member, nor does he reference theosophical authors much. George Lucas, Elvis Presley, and Einstein are known to have read some books on Theosophy. These groups started by theosophists or had as their most active members theosophists in their early days. Buddhist Society in England (was the Buddhist lodge of the Theosophical Society), was founded by the most famous and influential of Western Buddhists, Christmas Humphreys (see Christmas Humphreys), who was a member of the Theosophical Society early in his life and who wrote appreciatively about H.P. 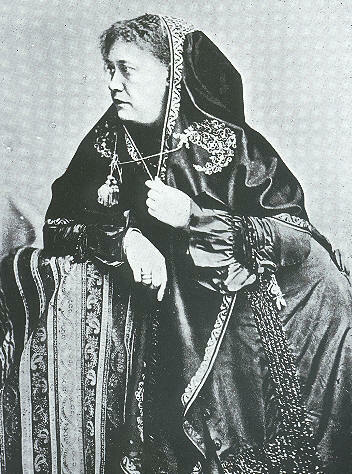 Blavatsky to the end of his life. Theosophy calibrated at 360, but which is the calibration of Madame Blabatsky and books? (Calibration on the scale of David Hawkins) Thank you very much! 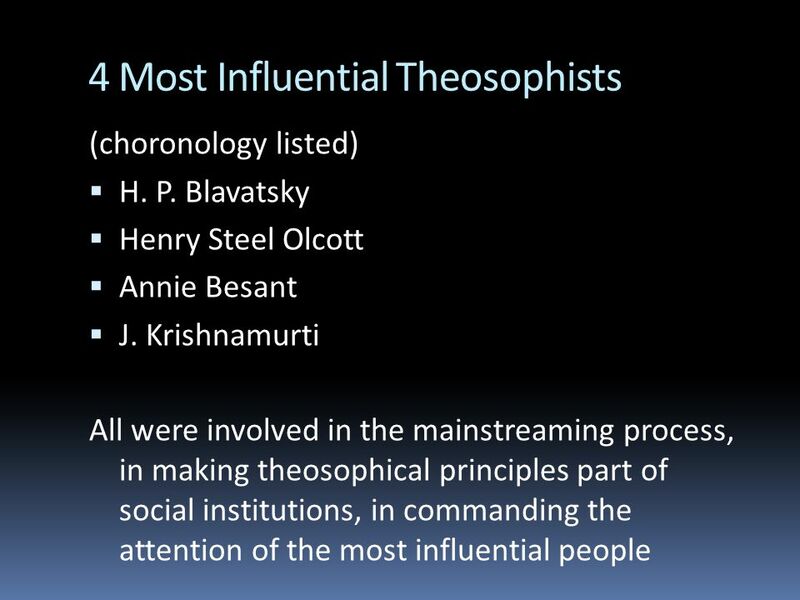 That’s the longest list I’ve seen of persons associated with Theosophy and a good addition. Many I was unaware had any connection. A good book on Brunton which shows the Theosophical connection is “My Father’s Guru,” by Masson. I don’t get the Hawkins though, which another person I knew got head over heels into for awhile.